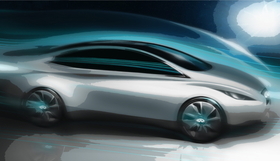 Infiniti revealed this sketch of its first EV in London on Sept. 24. Nissan Motor Co. premium brand Infiniti plans to launch its first full-electric car in 2013. The Infiniti EV will play a key role in the automaker's effort to move away from gasoline powertrains in favor of hybrids, clean diesels and EVs, Infiniti Senior Vice President Andy Palmer said in a statement. Palmer revealed a sketch of the five-seat sedan during the opening ceremony for the Japanese automaker's new dealership, which it calls an Infiniti Centre, in London on Sept. 24. Infiniti's EV is part of Nissan and French alliance partner Renault's lineup of eight different EVs for at least five key segments. Renault-Nissan CEO Carlos Ghosn says the alliance partners will be the first full-line manufacturer to make zero-emission vehicles accessible to the mass market, starting with the Leaf, which Nissan will begin delivering to European customers in January. The Renault Fluence large sedan and Kangoo car-derived van, which are set to debut in Europe in mid-2011, are also part of Renault-Nissan's 4 billion euro (about $5.2 billion) investment in EVs. Without being more specific, the alliance partners have said they aim to have an EV production capacity of 500,000 units in the next few years.